Kanye West is a quadruple threat: producer, rapper, songwriter, and record executive. His albums have sold millions; his lyrics are sung by renowned recording artists including Brandy, Usher, and Alicia Keys. In 2005, West was named to Time magazine's list of One Hundred Most Influential People in the World. He was in good company, with a peer group that included talk show host Oprah Winfrey (1954–), actor Jamie Foxx (1967–; see entry), and actor Clint Eastwood (1930–). West's lyrics have been criticized for encouraging children and young adults to drop out of school, an allegation he claims is based on a misunderstanding. His newest album, Late Registration, was released in August 2005. Kanye (Swahili [African] for "only one") West was born in Atlanta, Georgia, on June 8, 1977. His parents divorced when West was three. He was raised on Chicago's South Side by his mother, an English professor, and spent summers with his father, an award-winning photographer who became a church counselor. West graduated from Polaris High School and completed one year of art school at Chicago State University. He explained his decision to drop out of school to Kimberly Davis in a 2004 interview with Ebony magazine. "I dropped out of school because I wasn't learning fast enough.... I learned from real life better." Real life at that time included rapping and working with local artists. West felt it was time to pursue his music career full time, so he moved to New York in 2001. His mixes and beats were getting him a reputation as a man who knew his jams. Respected rapper Jay-Z (1969–) hired him to produce songs for his 2001 album The Blueprint. Sales of that album exceeded 420,000 in the first week alone. West went on to produce for a handful of stars including rapper Ludacris and singer Beyonce. He was doing well, making a name for himself. But he wanted more. While acting as producer to the stars, West cut his own demo (a recording that gives listeners an idea of the style and ability of the musician) and began shopping it around. Despite his solid reputation, no one returned his calls. Then in 2002, Roc-A-Fella Records, the label that signed Jay-Z, decided to give West a chance as a rapper. The company already knew he was a talented record producer. West signed a record deal that year and began recording in the studio. "My [future] is in God's hands. If He wants me to make another album, then He'll give me the inspiration to do so. I can't force it." On the way home from a recording session in Los Angeles, West fell asleep at the wheel and was involved in a head-on car collision that left him with a broken face and fractured jaw. The artist nearly died in the crash. He endured months of recovery, including reconstructive surgery that left his jaw wired shut. That didn't stop West from moving forward with the album. He explained the ordeal to Ebony magazine: "I feel like the album was my medicine. It would take my mind away from the pain— away from the dental appointments, from my teeth killing me, from my mouth being wired shut, from the fact that I looked like I just fought [boxer] Mike Tyson.... I nearly died. That's the best thing that can happen to a rapper." So with his jaw wired shut, West returned to the recording studio to sing on a regular basis until he was satisfied with his debut release. One song in particular, "Through the Wire," was the first track of several singles on The College Dropout to become a raging hit. The song chronicles West's ordeal. The album itself, which was released in 2004, went multiplatinum, selling 2.6 million copies. "The best thing is being able to get my creative ideas out," West told Ebony. "That's why I rap in the first place—so my voice can be heard." The College Dropout was hailed as one of the best albums of the year. Critics praised West for taking hip-hop in a new direction. Songs on the album focus on walking with God while trying to "be real," and the producer/rapper says it all with a gospel choir backing him up. Hip-hop violinist Miri Ben-Ari worked with West on the album. Ben-Ari told Ebony, "He has a vision for things, for example, to bring live instrumentalists back to the game and create music like they did back in the day. 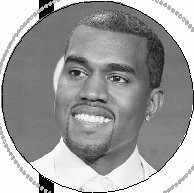 Kanye is very open to new things; he is not afraid to think differently, to take a chance and to say his thoughts out loud." An interview on UniversalUrban.com called West "one of a precious few rappers with actually something to say in his songs." West admits to writing lyrics on topics that aren't usually covered in rap music. "It's like if you wanna rap like Jay [Jay-Z], it's hard to rap like Jay and not rap about what Jay is rapping about," he told UniversalUrban. "Once I found out exactly how to rap about drugs and exactly how to rap about say no to drugs, I knew that I could fill the exact medium between that. Just think about whatever you've been through in the past week, and I have a song about that on my album." West won four Billboard Music Awards in 2004: Male New Artist of the Year, New R…B/Hip-Hop Artist of the Year, R…B/ Hip-Hop Producer of the Year, and Rap Artist of the Year. Jay-Z was born Shawn Carter on December 4, 1969. The Brooklyn-born boy was nicknamed Jazzy, which got shortened to the now-famous Jay-Z, which sometimes gets changed to Jiggy or Jigga. He is a man of many names and even more talent. Jay-Z grew up in the dangerous Marcy Projects of Brooklyn. Before he hit his teens, Jay-Z's father left the family. 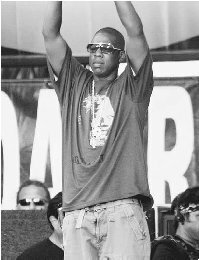 Without a figurehead to support the family, Jay-Z hit the streets to find a way to support himself. He turned to selling drugs, a theme that makes its way into many of his songs. Jay-Z yearned to break into the rap industry and kept company with Big Jaz, a rapper with a record deal. Big Jaz taught the fledgling rapper the ins and outs of the music industry. Jay-Z got tired of waiting for someone to recognize his talent, so he made a bold move and established his own record company. With friends Damon Dash and Kareem "Biggs" Burke, he founded Roc-A-Fella Records, and in 1996 he released his debut album, Reasonable Doubt. The album was unimpressive in terms of sales; it never got past number twenty-three on Billboard's album chart. But it is considered a classic among rap fans, and many call it his best work. The album spawned four hit singles, including "Feelin' It" and "Can't Knock the Hustle." Listeners of the album were rewarded with the sounds of R…B singer Mary J. Blige and rapper Notorious B.I.G. as well. Jay-Z followed his debut with the 1997 release of In My Lifetime, Vol. 1. The album reached the number three spot on the charts and included contributions from rapper Puff Daddy and R…B singer/songwriter Teddy Riley. Unlike Reasonable Doubt, this album moved beyond the gangsta rap sound to appeal to the pop rap listening audience. Singles like "This City Is Mine" helped Jay-Z branch out and get airplay, which helped sales of the album. Vol. 2: Hard Knock Life followed the pop rap trend. The 1998 release contained radio-ready singles such as "Hard Knock Life" and "Can I Get A ..." The album increased his airtime as well as his popularity. Jay-Z had six singles off that one release. Vol. 3: Life and Times of S. Carter was released in 1999. Nearly every single on this album featured a guest vocalist. The album was a huge hit among fans. Jay-Z began working with new producers for his next album, Dynasty Roc la Familia. The 2000 release included the Neptune's-produced single, "I Just Wanna Love U (Give It 2 Me)." The Blueprint was released in 2001, with producer/rapper Kanye West at the helm. Unlike his other albums, this one was mainly a solo effort. Many critics and fans consider The Blueprint to be Jay-Z's finest album. It featured one of the year's biggest hit single, "Izzo (H.O.V.A.)." The album helped West's career as well, cementing his reputation in the rap industry. Jay-Z collaborated with the Roots for his Unplugged album in 2001. R. Kelly teamed up with the rapper for the 2002 album, Best of Both Worlds. That same year, Jay-Z released The Blueprint 2: The Gift and the Curse. In 2003, the rapper announced his retirement but promised one more album. That promise was fulfilled with the 2003 release of The Black Album, which claimed the number one spot on Billboard's album chart. Jay-Z is kept busy with Rocawear, the company's clothing line and Roc-A-Fella films. He is co-owner of the New Jersey Nets basketball team as well as a New York sports bar called 40/40 Club. He is the first nonathlete to have a signature line of Reebok sneakers, called the S. Carter Collection. His shoe is the fastest-selling sneaker in Reebok's history. West's debut album won Best Rap Album at the forty-seventh annual Grammy Awards in February 2005. The single "Jesus Walks" won Best Rap Song. And though he was nominated for Best New Artist, he lost to the pop/rock group Maroon 5 (see entry). Altogether, West enjoyed ten Grammy nominations that year, either as producer or recording artist. He was not ignored for the Black Entertainment Television (BET) Awards, either. In fact, West walked away a double winner from the fifth annual awards in June 2005. He won Best Male Hip-Hop Artist and Video of the Year, for "Jesus Walks." West produced three different videos for that one song. The popularity of even that one single ("Jesus Walks") is proof that West has found a niche for his gospel/rap/hip-hop/ R…B style of music. But his tunes aren't without their critics. Barbara Kiviat of Time magazine asked the singer about the contradiction between the religious undertones of "Jesus Walks" and the profanity on the rest of The College Dropout. "Contradiction is part of who I am. I am a real person, and I make my mistakes and I laugh and I cry and I smile and I hate and I love," West replied. He also explained his commentary on college, which some critics say encourages kids to drop out. "People try to make it seem like if you go to college and you get all A's, that you'll move to the suburbs, have 2.5 kids and live happily ever after. But in many cases life just doesn't work like that.... What I'm saying is, Make your own decision." On July 2, thousands of recording artists donated their time and talent to Live 8, a concert held in ten cities and four continents across the globe. The mission of this free concert was to pressure political leaders into committing themselves to ending poverty in Africa. The concert was considered a huge success by all participants and its organizer, Bob Geldof (1954–). West performed in Live 8 in Philadelphia, Pennsylvania, despite being threatened with a lawsuit if he did. The rapper told MTV News, "We had to go through a lot be here today. I had another performance and they're like, 'There's no way you can be here—you'll get sued if you go to this."' West took the chance because he felt it was the least he could do to help out. "I would rather take that chance because it's important for my people," he told MTV. As if life wasn't already busy enough, West has begun plans for his own line of clothing and sneakers, tentatively called Pastel and Mascott, respectively. A self-proclaimed fashion lover, the business mogul claims to have been compared to Carlton, the preppy and polite character from the television sitcom "The Fresh Prince of Bel-Air." Kanye West performs at the 2005 Live 8 concert in Philadelphia. West established his own record label as well. G.O.O.D. (Getting Out Our Dreams) has already signed and released an album by John Legend (1979–), the label's first artist. West's second album, Late Registration, was released in August 2005. This was his first album made with his new production partner, film composer/musician/ songwriter Jon Brion. His contributions to the album include playing guitar and keyboards as well as helping with song composition. The partnership surprised people in the music industry. Brion is best known for his orchestral arrangements for female artists Aimee Mann (1960–) and Fiona Apple (1977–). Other recording artists who collaborated with West on Late Registration include Jay-Z, Maroon 5's Adam Levine (1979–), and Brandy (1979–). West's first single from the album, "Diamonds from Sierra Leone," received high marks from music critics. West wasn't so sure. The twenty eight year old told Teen People, "It's hard when people are depending on you to have an album that's not just good, but inspired.... I want my songs to touch people, to give them what they need. Every time I make an album, I'm trying to make a cure for cancer, musically. That stresses me out!" West worked with award-winning video director Hype Williams to produce a video for "Diamonds." The singer used the video to raise awareness of the so-called "blood diamond" trade of Sierra Leone. Millions of Africans have lost their lives to the mining of these diamonds. The video positions the glamorous life depicted in a modern diamond commercial against the images of the brutal blood diamond trade. "I wanted to do whatever I could to learn more and educate people about the problem," West told Business Wire. It's in the black person's soul, to rock that gold. Christian, Margena A. "Why everybody is talking about producer-turned-rapper Kanye West." Jet (January 31, 2005). Davis, Kimberly. "Kanye West hip-hop's new big shot: talks about his next surprising moves and why marriage is the key to life." Ebony (April 2005). Davis, Kimberly. "The many faces of Kanye West: producer-turned-hit rapper takes hip-hop in new direction." Ebony (June 2004). Foxx, Jamie. "Kanye West: in just a few short years, he has emerged as one of music's premiere behind-the-scenes hitmakers. But it took a near-fatal crash—and one of the year's most inventive songs—for him to take center stage." Interview (August 2004). "Kanye's Next Move." Rolling Stone (August 11, 2005): p. 16. Kiviat, Barbara. "Ten Questions for Kanye West." Time (December 20, 2004). "Throw Your Diamonds in the Sky: Kanye West Returns with Epic New Video 'Diamonds from Sierra Leone'; Hype Williams-Directed Video Set to Air This Week as Hot New Remix Feat. Jay-Z Blasts off at Radio." Business Wire (June 15, 2005). Birchmeier, Jason. "Jay-Z." MTV.com . http://www.mtv.com/bands/az/jay_z/bio.jhtml (accessed on August 9, 2005). "Kanye West." Rapcityz.com . http://www.rapcityz.com/biokanyewst.htm (accessed on August 9, 2005). "Kanye West." UniversalUrban.com . 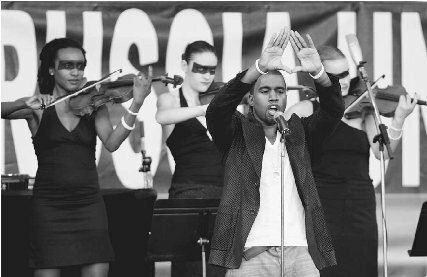 http://universalurban.com/kanyewest/index.php (accessed on August 9, 2005). "Kanye West: Biography." VH1.com . http://www.vh1.com/artists/az/west_kanye/bio.jhtml (accessed on August 9, 2005). "Kanye West in Legal Battle to Appear at Live 8." Femalefirst (July 4, 2005). http://www.femalefirst.co.uk/entertainment/69392004.htm (accessed on August 9, 2005).